Happy Friday friends!! The weekend is finally here! Today also happens to be the last day of school for my baby girl and summer break is officially here! This last week, I finished my first big project for my office/craft room revamp. It feels so good to check at least one thing off of the list. 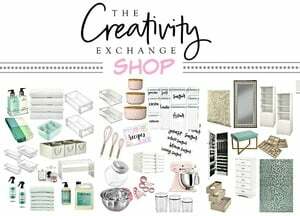 For those of you who might have missed it, we are in the process of revamping the playroom and turning it into my office and a crafting space for me and my girl. So many years ago, this big round table use to be our kitchen table and it’s now going to be our big crafting table and it will sit in the middle of the room of my new office/craft room/studio. This piece has an extra leaf that I also painted that will make this table even larger when we finally put it in its place. I am so in love with how beautifully it turned out can’t wait to get it in the space and start crafting on it! 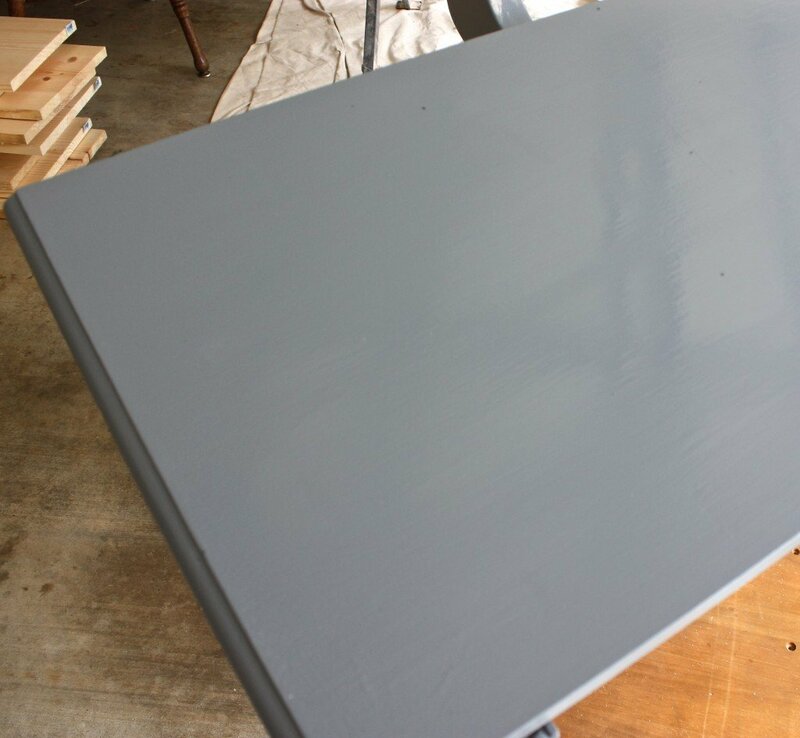 Because this table is going to get a lot of heavy hard use, I wanted to use an enamel oil based paint for industrial strength durability. I know a lot of people get a little nervous with the thought of working with oil based paints but there are times that enamel paints are really the best choice. There are some little tricks to working with enamels that make painting so much easier and the finish absolutely flawless. 1) I start by always lightly sanding the piece with fine grit sand paper. I sand just enough to rough it up and get any remnants of a top finish off of the piece (Rough sand paper can leave lines and scratches that can be seen through a paint finish). 3) After the primer dries, I lightly sand the primer to make sure its smooth because the primer will leave ridges after it dries. 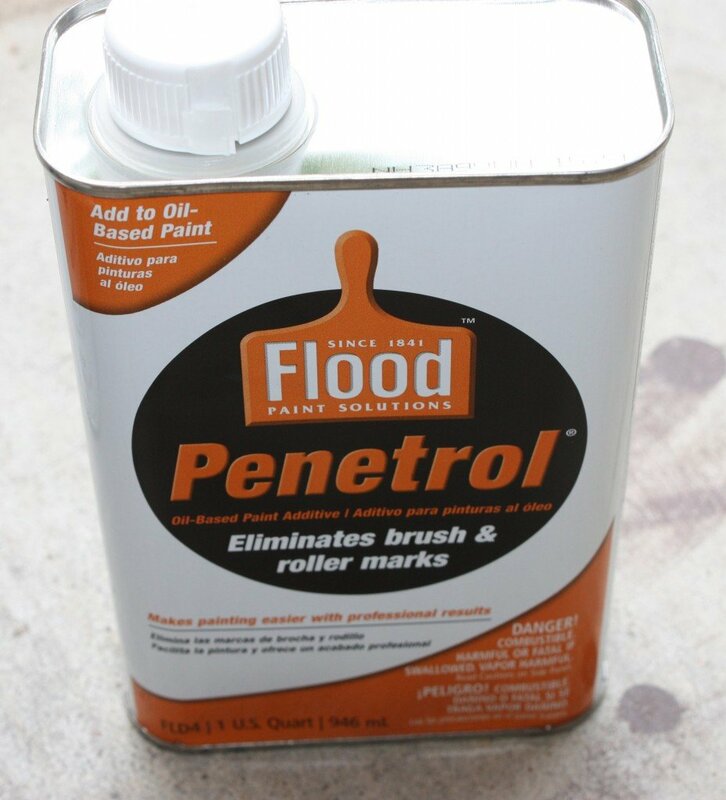 Penetrol helps to make to make the enamel less tacky, extends the working time and helps to eliminate brush marks. I pour my paint into a small bucket (about three cups), I then pour in roughly two tablespoons of Penetrol. 7) I allow oil based paints to try at least 3 days but keep in mind, it takes at least two-three weeks for oil based paints to cure, which means that you have to be careful not to do anything heavy on the piece during this time. You can use the piece, just be careful during the curing time. After the piece has cured, you can pretty much do anything to the piece and you can’t damage the finish. I personally think it’s so much easier to work with oil versus water based because the oil based spreads and eliminates and marks. I do not have to worry about brush marks and once the piece has cured, it is really indestructible. By the way, I noticed this week on Facebook that Sherwin Williams has a 30% off coupon valid through June 17th. If you have a summer paint project planned, this is a great deal and you can always buy your paint ahead of time with this coupon here. I decided to go with the Vesdura Century Oak and I was beyond thrilled when they arrived! It is almost impossible to tell that they are vinyl and the color is exactly what I had envisioned. I can’t wait to get the floors installed next week! Have a great weekend friends and I’ll be back on Monday! « My First Video Blog Post (Office Project Update).. I like oil-based too for projects that need durability. I just finished my kids’ kitchen cabinets with Ben Moore’s Advance waterborne alkyd. 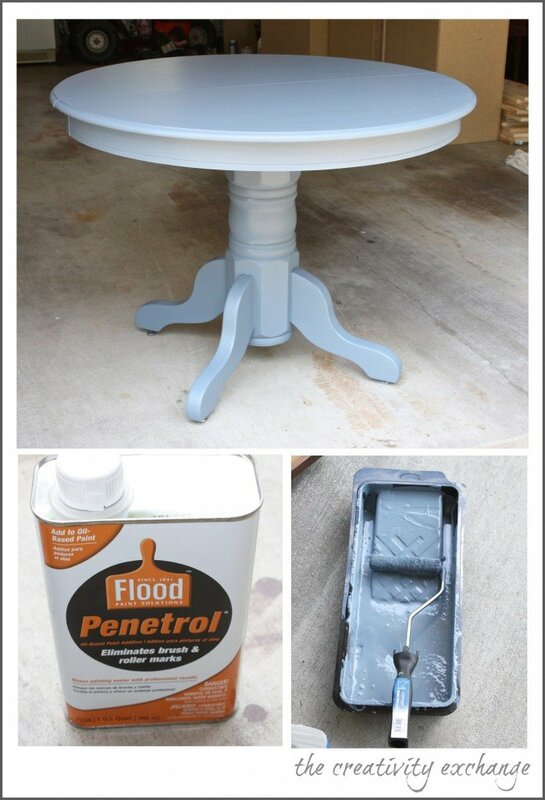 No Penetrol needed….I could literally watch the paint level itself. I used a microfiber roller and a small angled brush. The paint itself is oil-based, but waterborne, meaning it has no smell and cleans up with soap and water…but dries to the same finish as regular oil based paint. I”m told SW also has a product similar to the BM Advance…hopefully it’s cheaper 🙂 Beautiful table! Can’t wait to see your craft/office space when it’s done. Oh Wow Cindy, I haven’t heard about that paint. I will for sure check it out and its great to know you still get the smooth leveling. Is it less tacky to work with as well? Thank you so much for telling me about this and I will give it a try! Thanks so much for stopping by! Love your table!! What will you do with chairs? Can’t wait to see flooring put down! Such great tips, Cyndy. Your table turned out lovely! I’m going to have to pin this for when we want to paint our kitchen table. 🙂 I love the flooring you ended up picking out too. Thanks Megan! 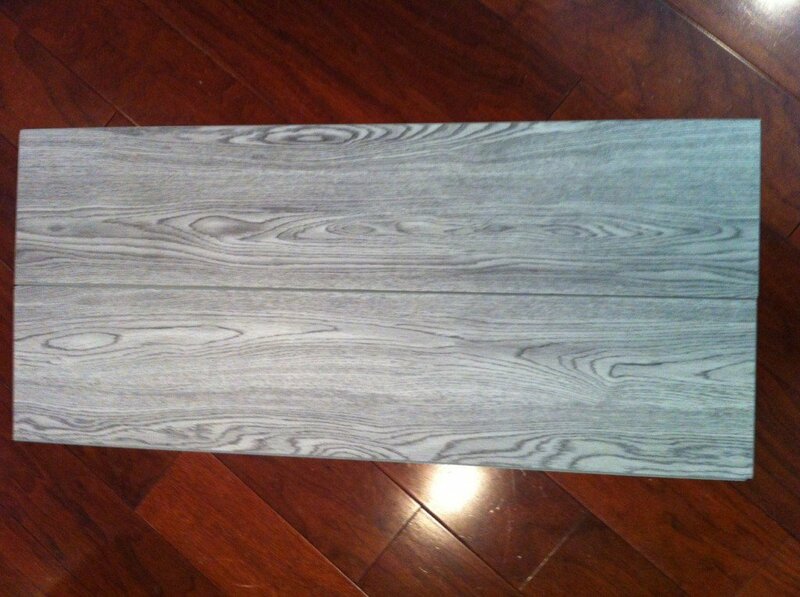 I am so in love with the table finish and can’t wait to get it in the room. We are installing floors in the morning! I probably won’t sleep tonight I’m so excited. Thanks girl! 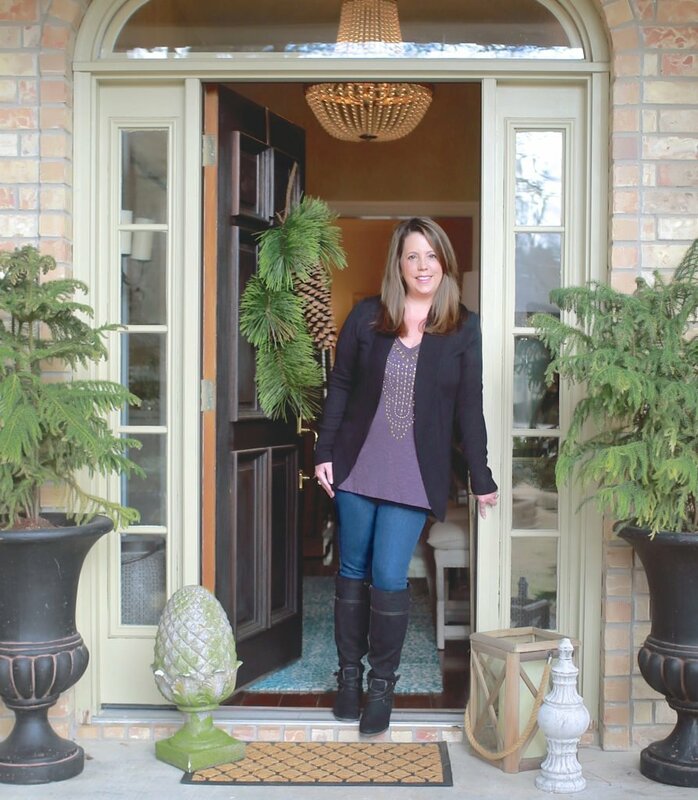 Hey I love your table – so well done and looks beautiful. 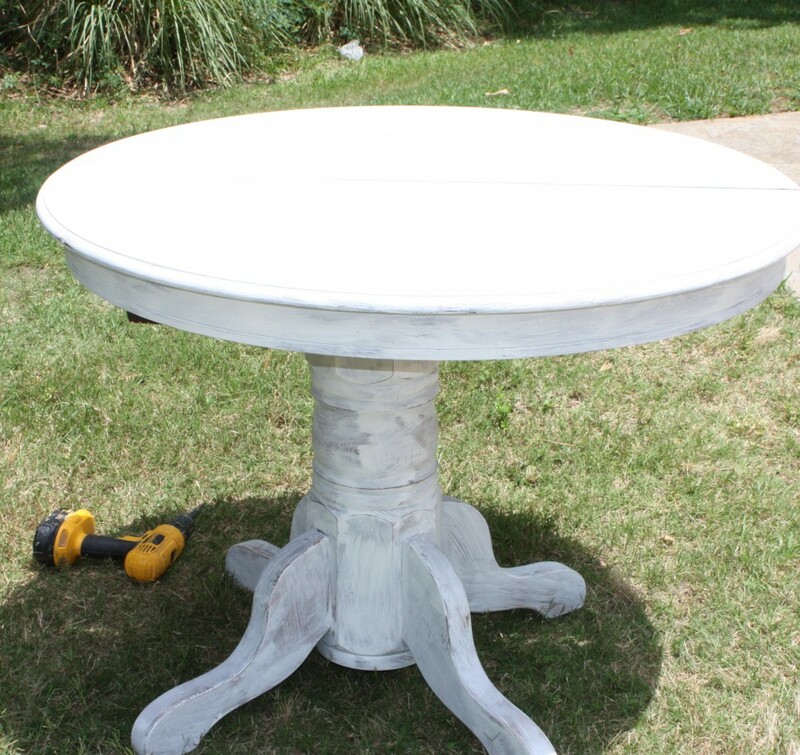 I have a question – I have a center table that’s badly scratched, bought it from the bombay store – it looks bad now.. don’t want to get rid of it but i am not sure if i can restore it… should i start by sanding it or is it different for a table that has the store paint and varnish. Please give me some pointers. BTW those floors look AMAZING! Can’t wait to see what you do with them! 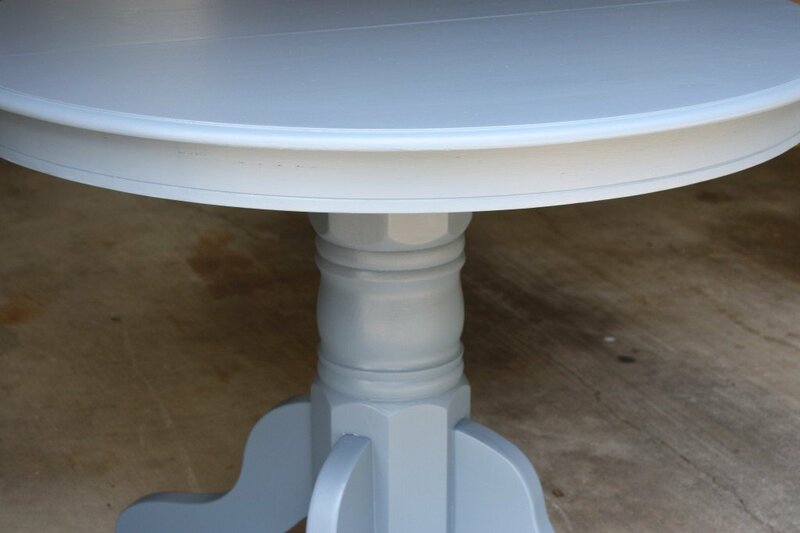 I love how the table looks painted… so fresh and pretty. I too find that oil paint is great for furniture! 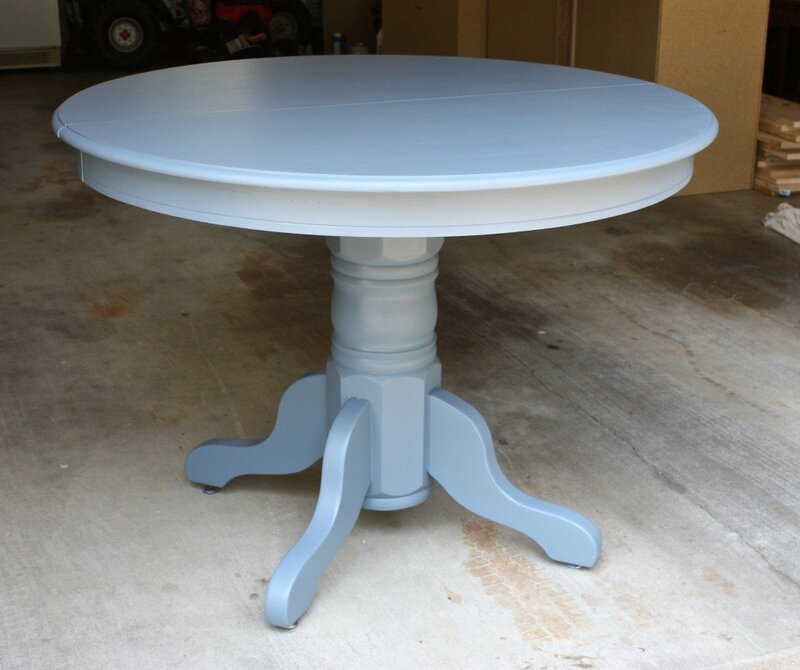 Though I have taken to DIY chalk paint lately and like the finish of it once it has been waxed as well. 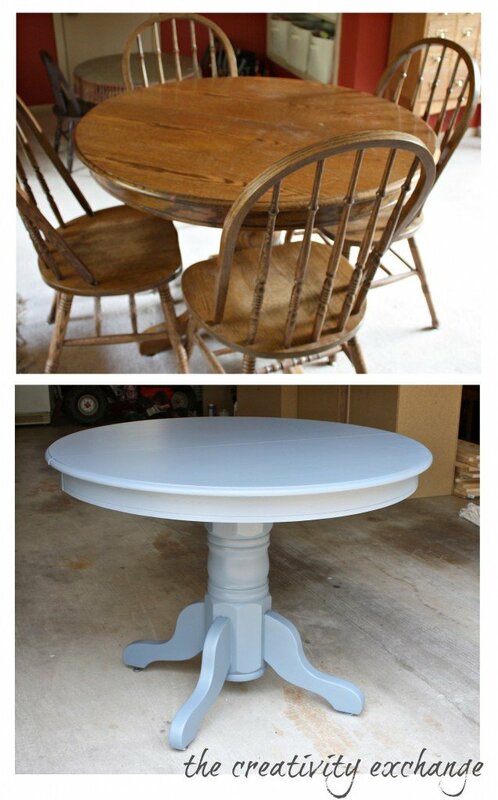 I have a table just like this in my basement that I hope to paint soon. Those floors are totally fabulous too!! 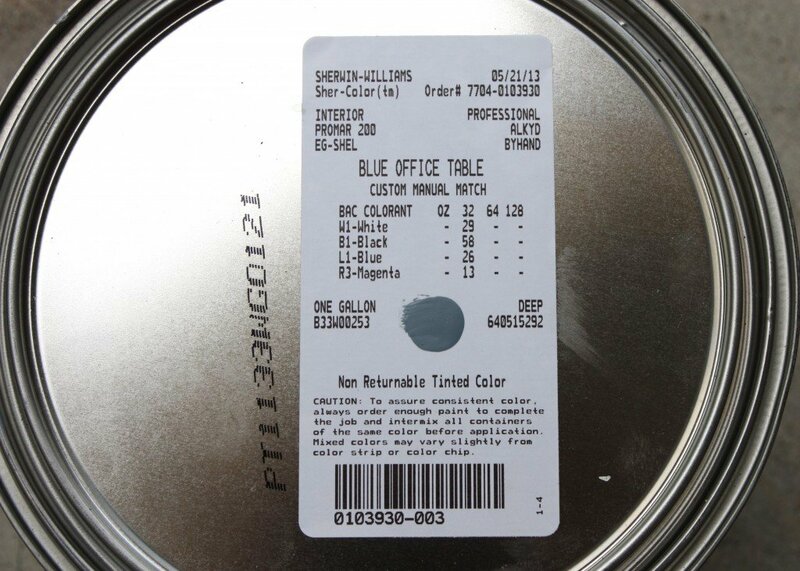 Hi, I noticed that the color label from the photo above indicates an eggshell finish but your narrative says satin/matte finish- can you explain. Which finish did you use on the table? 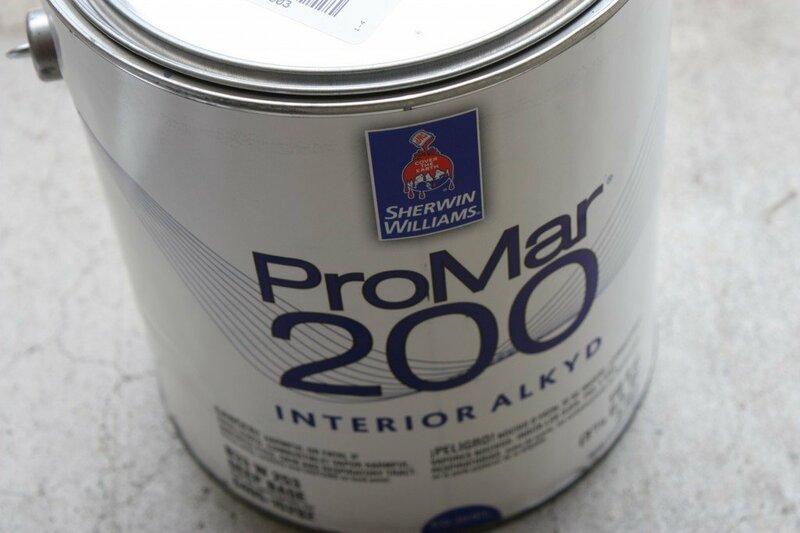 When it comes to the Pro Mar 200 oil-based paint that I used for this project, they only offer Eggshell, Semi-Gloss and Gloss and the eggshell is the lowest matte/satin sheen. They may have a flat with no sheen at all but eggshell/satin/matte in paints is pretty much the same thing and means very low matte sheen. Thanks for for your question and stopping by. The table looks beautiful! Did you do anything special to hide the wood grain or did the paint fill everything? 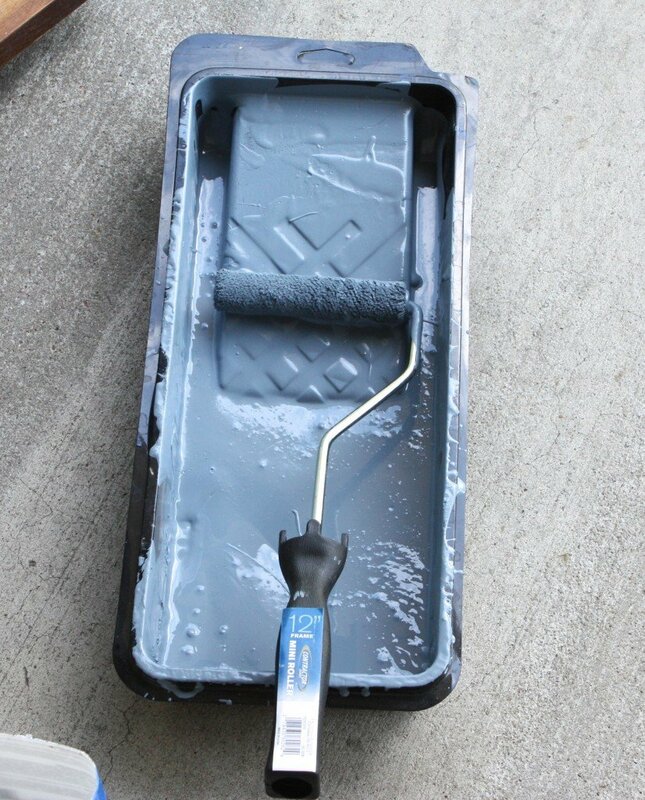 On your second coat, did you use a roller again or an actual paint brush? Hi Shaun, I used a brush to keep it smooth. Thanks! How’d the table hold up, without a sealing? I’m doing my dining table, and I’ve read two blogs, one says to seal enamel and you say it’s fine without…I’d love to know how your table is doing. That’s awesome, thanks for getting back so quickly. My girls use our table for everything, and I for sure need something they can write on, paint on and decorate cookies on. Now to pick colors, which may be the hardest part? Great tip for removing paint! Craft paint sticks like crazy, and I have quite a few globs on my table now. I am for sure adding extra time for the table to stay in the garage, I won’t be rushing it back in the house. I’ve been searching for the perfect white, not bright but not tan…think I found it, but still looking.